Mountains of the World by Dieter Braun explores the mountains of the world and their diverse inhabitants. 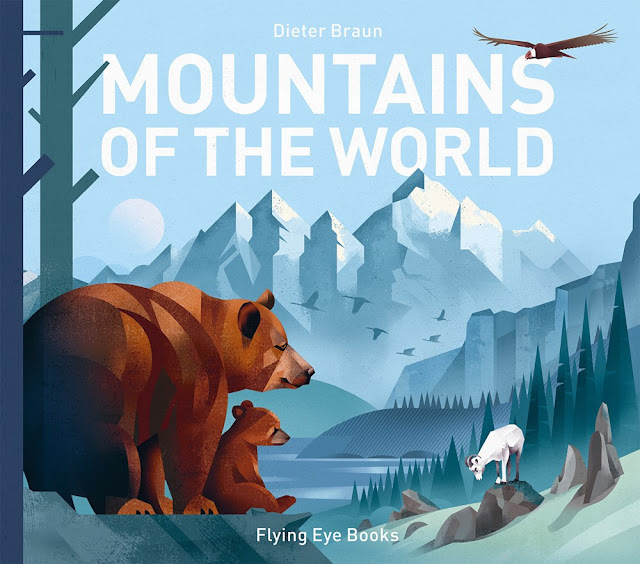 Within the ninety-three pages of Braun's book, readers visit the world's most remarkable mountains and learn about the people and animals who live in them, the way they're formed, and the famous people who have summited them. Careful attention is given to the design of the book, with textured covers that have debossed text and endpapers that provide a small extension of the story in the form of a height map. Like Braun's other works, the geometric illustrations feel dynamic, but the style seems particularly well suited to the topic of exploring mountains with their sharp edges and shadows. And, of course, the captions and text feel organic on each illustration, making it a beautiful and accessible book for a wide variety of ages and curiosities, as well as one to be revisited time and time again. Mountains of the World published this week from Flying Eye Books!